Berger Paints is offering customers in the GCC total exterior protection with its new luxury range of Weathercoat finishes. According to the premier paints and coatings manufacturer, the range covers everything a consumer may need for building exteriors: luxury smooth finishes, premium texture finishes that are also elastomeric and anti-carbonation coatings, luxury signature finishes, advanced temperature reduction coatings and premium acrylic spray coating among others. “Berger Paints has always been at the forefront of technology, introducing many world-class products across the finishes market. 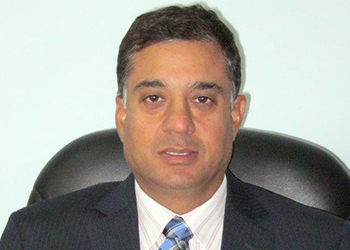 Using its innovation, state-of-the-art technology and thorough market research, Berger Paints has created this advanced exterior finish system, Weathercoat,” says Manish Mehra, regional head - Middle East and Egypt. “By far the most comprehensive exterior system to date, Weathercoat offers a range of premium, technically advanced finishes over multiple product categories, designed to work together or independently to create the complete exterior solution,” he adds. • Weathercoat Ultra: This is a luxury smooth finish that has been exclusively formulated by Berger for the Middle Eastern climate. “Weathercoat Ultra is a superior performing exterior paint that does not compromise on quality,” Mehra stresses. “With its superb technological formulation, the paint delivers a lasting 10 years-plus performance and withstands the harshest of climatic conditions, ensuring walls are protected month after month, year after year. 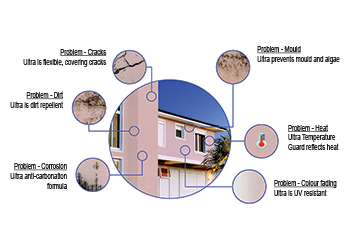 Due to its anti-carbonation properties, Weathercoat Ultra safeguards walls against corrosion. It also contains dirt-resistant properties, ensuring the walls look new and pristine for a longer period of time. Delivering superior ultraviolet (UV) resistance, the product contains both Temperature Guard – an advanced heat reflecting technology –and anti-fade protection, keeping interiors cooler by reflecting the heat and also ensuring a smooth finish and long-lasting vibrant colour. Berger’s Weathercoat Ultra exterior protection. “Weathercoat Ultra provides total protection for exterior walls; not only will your walls have a beautiful smooth finish with full rich colour but also long-lasting protection. It is the only product that offers the ‘complete solution’ for your exterior needs,” says Mehra. • Weathercoat Stoneshield: This is a unique textured marblesque exterior finish with superior aesthetics and an ultra-luxurious feel. However, it is more durable, versatile and consistent in both quality and texture when compared to marble, according to him. • Weathercoat Vintage: This high quality exterior finish helps recreate the architectural grandeur of the bygone era, with the dual benefit of protection and aesthetic appeal. Vintage delivers old-world elegance to building exteriors and comes in a range of five vintage effects and 12 earthy shades. “The system combines the best of both worlds – the aesthetics of old-world grandeur with the benefits of today’s technology. It performs the role of a superb decorative plaster and finish, combining decoration and protection in one,” Mehra claims. • Weathercoat Selections: A comprehensive collection, these coating systems are highly durable, low maintenance and leave exteriors with a luxurious, brilliant finish. Selections offers a variety of finish systems to suit the client’s exterior requirements; they are available in either acrylic or epoxy and can easily be top-coated with an acrylic system or a very hard-wearing polyurethane (PU)-based system. It offers a wide choice “for example, if you require the highest colour and gloss retention and supreme durability, a PU-based system will be the best choice. Each Selections system is an extremely durable coating with an appealing designer finish, enhancing the décor and aesthetics of the architectural structure,” he says. • Weathercoat Flextex: Designed to withstand harsh weather conditions, Weathercoat Flextex is described as a first-class elastomeric anti-carbonation coating. “The flexible coating is very heavy bodied, offering crack bridging technology of about 2.85 mm, covering cracks and gaps and providing a flawless finish. The durable 100-per-cent acrylic formula offers a 10-year lasting performance with high protection against UV rays, keeping colours vibrant. It also contains an advanced anti-carbonation system safeguarding against corrosion and anti-fungal and dirt-repellent properties, keeping walls looking pristine,” Mehra says. Weathercoat Flextex is available in a smooth or textured finish and can be matched to the colour of the client’s choice from the extensive Berger fan-deck. Berger International is part of the Asian Paints Group, which ranks among the Top 10 four decorative coatings companies in the world. The group, with a presence in 20 countries, is spread across the Caribbean, the Middle East, South Asia, South East Asia, Africa and South Pacific regions. It has 30 paint manufacturing facilities worldwide which service customers in more than 50 countries.